So the sun has finally come out for a few minutes and we head to the nearest park that has a creek. We rode bikes, I carried along a bright orange net and my Diana F+. 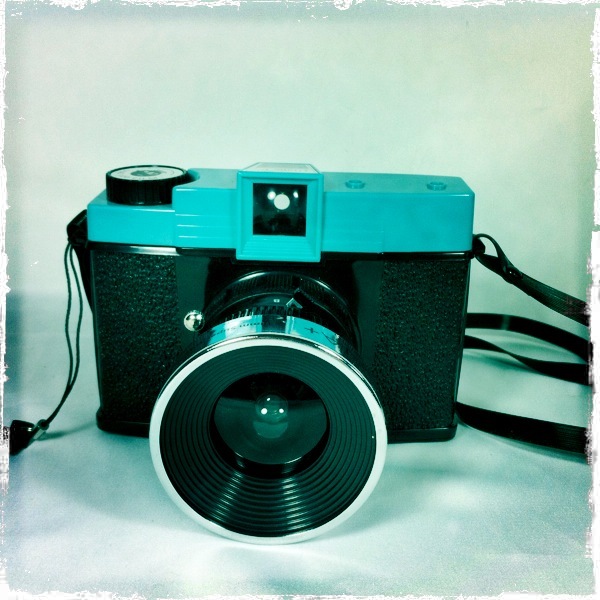 If you do not know, the Diana F+ is an all plastic – including the lens, totally analog, toy camera that normally takes 120 film, although, I have changed out my back to accommodate 35mm film. This is from my third roll of 35mm color film. Since there is no metering you kinda have to guess how long to keep the shutter open for. I have had some really under exposed and over exposed shots so I did a little dance when this one was ok. The other thing is that some of my shots were double exposed because I kept forgetting to advance the film with each shot! Unfortunately none of them came out even remotely artistic or “happy accidents.” SO… Here is what the Diana F+ looks like (photo taken with my iPhone with hipstamatic) and an example of what to expect from your analog camera (after some trial and error! ).